Atomify LAMMPS is an easy-to-use visualizer and editor for the molecular dynamics simulator LAMMPS. Atomify supports OpenMP acceleration, live plotting of LAMMPS variables and computes, and an easy to use code editor in one single program. The latter utilizes the powerful machinery already built into LAMMPS to allow easy access to advanced physical quantities. 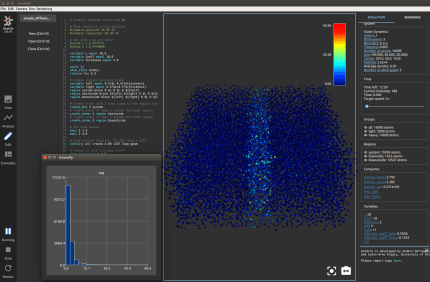 Atomify is open source software written in C++ built on top of Qt.